How Does Bridge Work For Retailers? An online store and gift registry. A social network connecting you with your business friends. You will decide if you are using the Bridge Store or your own 3rd party e-commerce store. View examples here of how stores have integrated with their Bridge account. The explanation below applies to you using the Bridge Store. You can add any product from any brand to your Bridge Store. In addition, it can be pre-populated with up to 60,000 products from 100+ Smart Brands. With both free and paid accounts, you can use our software to quickly list all the brands that you sell. Bridge offers you a directory of 2,100 brands from which to pick. You can also add any brands to your site that are not in our existing master brand directory. You can send sync requests to Smart Brands that you sell. Smart Brands have a partnership with Bridge and all their items may appear in your Bridge Store if you and the brand approve each other's sync request. Smart Products are updated for you and thereby save you time and money. You can also show more products than you'd normally show when you use Smart Products and this helps increase sales. You can add your own products to your Bridge Store. For example, you can add one-of-a-kind items such as unique jewelry or antiques. If you have a gift registry program in your store, you can use Bridge's gift registry software to show these registries. Family and friends can visit registries on your site and make purchases from them. Customers can checkout via your Bridge Store. You'll receive an email with the customer's ordered item(s), billing information, shipping information, telephone number, and email. If you have real-time credit card processing setup with Bridge, your Bridge Store will ask the customer for his or her credit card information during checkout. The payment will appear in your bank account within a day or two. 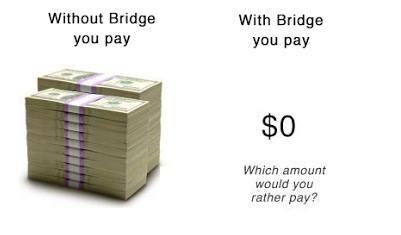 (Bridge does not take a commission/percentage of the order.) If you do not have real-time, online credit card processing setup, you'll use the telephone number from the order email to call the customer and collect credit card details via telephone. You will key the credit card number in to your in-store terminal. Using Bridge, your customers can shop from 1,000s of items and you save yourself 100s of hours and $1,000s on website maintenance. You can use your Bridge to share news with your business friends as well as with the public. It's akin to a Facebook page but for your business. You'll receive a weekly email with prices changes, new items, and best sellers. What Brands are Smart Product Partners? How Will Your Retail Shop Use Smart Products? You can use Bridge's Smart Products service a few different ways. For starters, you can use use your Bridge account as an image and product library to view and download product data from your most popular brands. Your account offers comprehensive product data from 110 brands on one site vs having to visit 110 different brand websites. 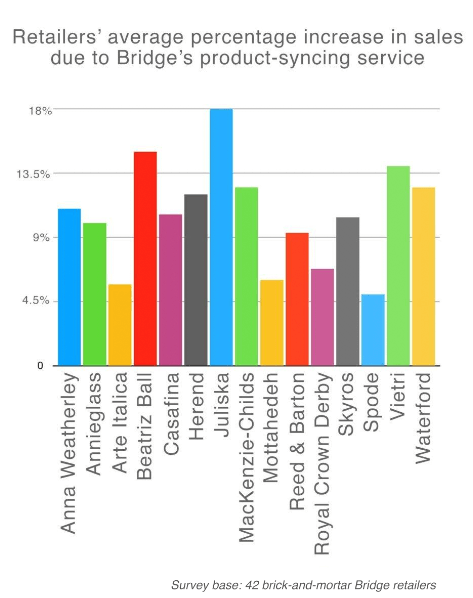 You can download this data from your Bridge account. You can use this database as a 'one stop shop' to get all the current product prices, pictures, dimensions, stock, and descriptions. All of the different brands products will be formatted the same way in one Excel sheet and then you can then easily import this into your website or POS. If you wish to skip downloading the Smart Product data and then importing it into your website, Bridge offers you an e-commerce website that is pre-populated with your Smart Product data in it. You can use this website to sell the Smart Products to your customers. The e-commerce store (which includes gift registry software) also allows you to add any item from any brand. As such, you can sell any item from any brand (even if its not a Smart Brand partner). If you have a website with a 'splash' page and/or that is just informational, you can add a link on this page that says, for example, "Gift Registry" and have it link to your Bridge's gift registry. Will Bridge Work With Your Existing Web Platform? How Do Smart Products Help Your Gift Registry? More brides will register at your store. Brides will add more items to their registries. Your registry sales will increase. You'll save time and money in your management of registries. How Do You Typically Add a Brand's Products To Your Website? Most retailers receive a Dropbox link from a brand with an Excel file and images. What if there was an instant way to add these products to your website? There is: Smart Products. Smart Products let you bypass Dropbox and Excel. You can use Smarts Products to save time and cut costs. Let's imagine your retail store would like to add Herend (a producer of fine tableware and giftware) to your website. Herend offers 4,000 SKUs. Using the Smart Products program, Herend shares these 4,000 products with its retailers instantly. If a store were to add these items manually without Bridge, it would pay someone $100s and require a week or more of time. With Bridge, it costs the store $0 and the items are online in minutes. Fast. Products can appear on your site instantly. Slow. Often requires manual processing and uploading to a website. Super cost efficient: $0.01 per item/month Expensive. Costs your business on average $2+ to add and maintain each item on your site. Doesn't require more staffing. Maintenance-free product management. Requires computer savvy staff. Accurate prices and product content because Smart Brands are maintain their respective items. Inaccurate. An indie store maintaining 10s of brands' prices and content is nearly impossible. Fast and cost efficient. After one-time sync, all data from brand is 'live' on your website. Slow and expensive. Requires constant downloading of Excel files and images, and then uploading this to your website. Use one Bridge account to access content from 100+ brands. Brands often send files to multiple emails and accounts, thereby creating a mess of files in different locations. Intuitive. Products appear next to relevant files. Eg: Waterford products appear next to Waterford files. Not intuitive. Files don't appear in context. Dropbox files are often unorganized and not organized like a website nor catalog. Stores often display 100% of a brand's products online. The Smart Products program makes doing so quick and easy. Stores often show just a fraction of what the brand offers online. Reason: the stores have to manually download content from Dropbox and add it to their sites. Is Bridge Right For Your Store? A website or online presence that needs improvement. Little or no online product offering. Little or no budget for website development, operations, or maintenance. Little or no technological know-how. Little or no time to spend on website maintenance. Thankfully, Bridge can fix all of these issues quickly. Most other online platforms require time, money, and digital savviness. Bridge is designed to help indie retailers bypass these barriers.